Filled with an air of irresistible French charm, this tapestry "Fountain by the Lake" shows a scene from the "Noble Pastorale" a series of 6 tapestries by French artist Francois Boucher. There is a romantic interlude here between the young couple by the lake. They are accompanied by a playing child with a dog and sheep. The works of Francois Boucher often portrayed life of the nobles in an idyllic countryside setting. Here we see a gorgeous river side setting with a flowing cherub fountain nearby again alluding to romance, with a gorgeous mountainous landscape in the distance. This work is truly a beautiful piece of romantic art on all levels. 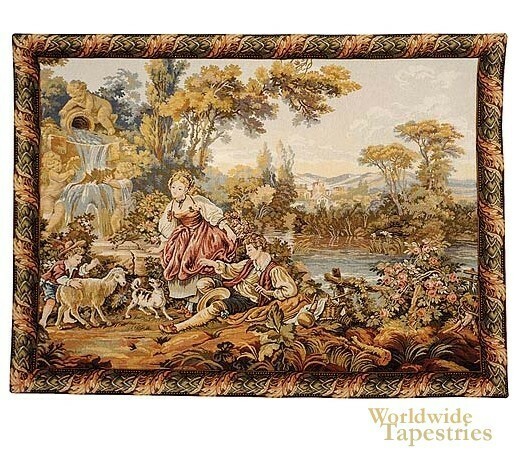 This French Francois Boucher tapestry "Fountain by the Lake" is backed with lining and a tunnel for easy hanging.